WASHINGTON — A House funding bill approved by an appropriations subcommittee May 9 will help keep a mission to Jupiter’s moon Europa on track for a launch in 2022. The bill provides more than $21.5 billion for NASA in fiscal year 2019. It specifically includes $545 million for Europa Clipper, a mission to orbit Jupiter and perform multiple flybys of the icy moon Europa, which scientists believe is potentially habitable. The bill also includes $195 million for a follow-on lander mission. The bill specifies that both Europa Clipper and the lander spacecraft launch using the Space Launch System rocket, in 2022 and 2024, respectively, language included in previous years’ appropriations bills. NASA’s budget proposal offered only $264.7 million for Europa Clipper and nothing for the lander, and projected a 2025 launch for Europa Clipper using a commercially procured launch vehicle. Rep. John Culberson (R-Texas), chairman of the subcommittee and a vocal advocate of Europa exploration, highlighted the funding for the mission in his statement at the markup. “We’ve also increased funding to the planetary programs, including the vitally important Europa mission,” he said. That funding, he said, is keeping the project on schedule for a June 2022 launch. The project is currently on a “glide path” towards a preliminary design review in August, with reviews of various instruments and other subsystems ongoing. That would allow the mission to enter Phase C of its development in November. While work on the spacecraft and its instrument complement is going well, one outstanding issue remains the choice of launch vehicle, he said. Launching on the SLS allows the spacecraft to go directly to Jupiter, while other vehicles would require the use of gravity assists at Earth and Venus to get the spacecraft there, about five years later than on a direct trajectory. For now, Goldstein said the project was designing the spacecraft to be able to use either approach. “We’ve been making sure that the spacecraft and the instruments were both compatible” with the direct trajectory and gravity-assist alternative, he said. The introduction of SpaceX’s Falcon Heavy, which performed its first launch in February, does not significantly change the debate. At the meeting, Goldstein showed performance capabilities, expressed in a metric known as characteristic energy, or C3, of several different launch vehicles, including both the Falcon Heavy and one with an additional kick stage. “Both of those are well below the C3 we need to get a direct trajectory to Jupiter with a vehicle of our mass,” he said. He added that both the original Block 1 version of SLS, as well as the Block 1B with the more powerful Exploration Upper Stage, are the only vehicles with C3 values high enough to allow for a direct trajectory for the six-ton Europa Clipper spacecraft. The less-powerful Block 1 is still sufficient, he said, mitigating concerns about any delays in the development of the Block 1B. “We feel comfortable that both SLS variants would be able to take us on a direct trajectory,” he said. Goldstein said later in the meeting that the spacecraft is being designed for the “more stressing” case of the gravity-assist trajectory, which will expose the spacecraft to more intense thermal conditions because of the required Venus flyby. A final decision on the launch vehicle won’t come until the project’s critical design review, scheduled for November 2019. 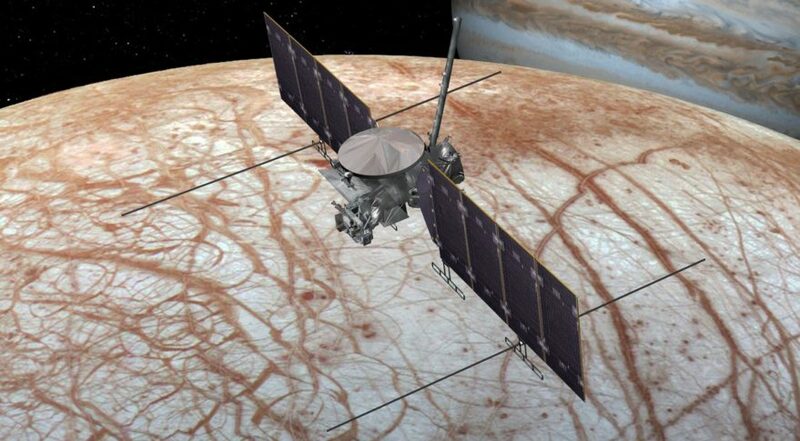 He cautioned that the continued progress on Europa Clipper is dependent on receiving sufficient funding at levels well above what the administration has proposed. That has not been a problem so far, though, thanks to support the mission has in Congress from Culberson. At the May 9 markup, Culberson passed around a scientific paper with involving a new discovery about Europa and the existence of plumes that offer additional proof that the icy moon has a subsurface ocean of liquid water. “Just in case I hadn’t seen it?” the full committee’s chairman, Rep. Rodney Frelinghuysen (R-N.J.) asked, looking at the paper. “There it is,” Culberson responded. As it turns out, the paper in question had not been published yet, and the journal had embargoed its release until May 14.